It was chilly and rainy today, but since it's June, I wanted something summery. Luckily, I had a couple of slabs of baby back pork ribs in the freezer and some of my favorite rub in the cupboard. I posted this recipe last summer here, but took a lousy picture. I didn't make the sauce this time, but really enjoyed the KC Masterpiece, original flavor. (I selected it because high fructose corn syrup wasn't the first ingredient on the label--it was the second, but tomato puree was first and that made me feel a bit better about using a store-bought sauce. )I adjusted the method from last year, just a bit. The broiling step allowed for a finished, slightly charred outcome. Yum! Here's the dry rub recipe. Place all ingredients in an air-tight container and shake well to combine. It will keep on the shelf for months. 2. 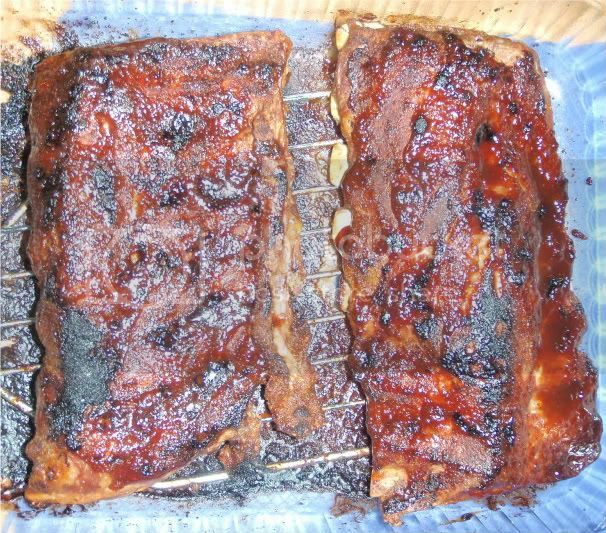 Rub ribs generously on both sides. 3. Place on a rack in a baking pan, cover tightly with foil. Bake for 90 minutes or until tender. 4. Remove foil and brush with sauce. Broil for 5-7 minutes or until you see slight charring. I made two slabs of ribs, about 2 lbs, but the rub will cover probably 10 lbs.